Haha! My favorite John Hughes movie! I love it! Those pancake muffins looks really yummy. I may have to try them sometime. This movie was on the other day, maybe yesterday, not sure but, as usual, I watched it and shed a little tear because what a damn good movie. RIP Mr. Hughes and Mr. Vernon and I totally saw Men at Work. Golf clap anyone? Classic movie. The fashion and music may change but the story is timeless. Pancake muffins? That's brilliantly evil. Must try them immediately. Mal - you can make them for Kylar when she's of pancake-age! Margie - I forgot that Mr. Vernon passed away, too :( I'll tip my thermos of soup in his memory. Wendi - indeed, such a timeless story. Pretty great soundtrack, too. I've definitely tried to mimic Claire's moves during the dance scene. Okay, how many times have I watched this movie with you girls. Loved it every time, like Pretty Woman. I have to make these pancake muffins for the grandbabies! Love you chickadee! Breakfast Club is my favorite of the Molly Ringwald trilogy. And my overall favorite 80's movie. Yummy, Ali!! 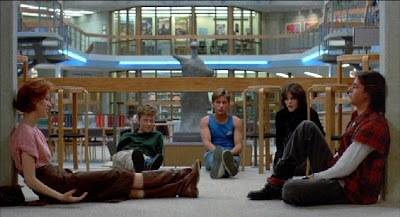 The Breakfast Club--my all-time favorite John Hughes movie. And so many memorable quotes..."Did your mom marry Mr.Rodgers?"... "No, Mr. Johnson.". So funny! The boys are going to love these muffins. I'm thinking I could also let them see the movie but I'd have to keep it on mute the whole time. Love you #4! I thought Pretty In Pink was a great movie! Pics are lookin dope, Ali! Seesters - I'm picturing Mariko doing the punch-walk dance that Emilio Estevez does. And Manda, how did I know you'd re-enact the punch finale? Bryan - thanks! BB's a good guy. Pancake muffins are the perfect accompaniment to a java mocha capuccino chai latte tea! I'm more of a soy-espressocino-no-whip-no-cup type of gal. Dessert for breakfast?? Yes please! These look awesome. Love that drizzle of maple syrup! Ms. Meanie - that's what I love about muffins and cupcakes. Their names are pretty interchangeable so I can eat a chocolate chip "muffin" for breakfast and not feel guilty about it, lol. Grace - such a great final shot! I read that one of Hughes's trademarks was using a freeze-frame as the final shot for many of his movies...I never realized it until now.